Plants usually cespitose, sometimes producing short rhizomes. Culms 30-210 cm. Sheaths usually glabrous, keeled; blades 9-45 cm long, 1.5-9 mm wide, flat, usually glabrous, occasionally pubescent. Peduncles to 10 cm; rames 2-8 cm, with 6-13 spikelets, exserted. Sessile spikelets 6-11 mm; calluses about 0.5 mm, hairs to 2.5 mm, awns 2.5-17 mm; Pedicels 3-7.5 mm, straight or curving out at maturity. Pedicellate spikelets usually 1-6 mm, sterile, without lemmas, occasionally staminate and with a lemma, unawned or awned, awns to 4 mm. Schizachyrium scoparium var. scoparium grows in a variety of soils and in open habitats. It was once a dominant component of the prairie grasslands that extended through the central plains of North America and into Mexico, but it has largely been replaced by fields of maize, wheat, sorghum, sunflowers, and field mustard. It is the most variable of the varieties recognized within S. scoparium, with morphological features that vary independently and continuously across its range, coming together in distinctive combinations in some regions. Some of these phases have been named as varieties, or even species, but they have proven to be untenable taxonomic entities when plants from throughout the range of the species are considered. Perennial tufted herb, sometimes with short rhizomes 30 cm - 2.2 Leaves: with open sheaths that are longitudinally ridged, usually hairless, often covered with a whitish waxy coating (glaucous). The membranous ligules are 0.5 - 2 mm long, while the blades are 9 - 45 cm long, 1.5 - 9 mm wide, flat, and usually hairless. Inflorescence: terminal and axillary, consisting of 2 - 8 cm spikes with six to thirteen spikelets. Fruit: a caryopsis. Culm: 30 cm - 2.1 m long, 1 - 3 mm across. Spikelets: either stalkless or stalked. The stalkless spikelets are 6 - 11 mm long with two florets, while the stalked spikelets are sterile or male and 1 - 6 mm long. Glumes: longer than the florets, lance-shaped to linear, membranous. The lower glume surrounds the upper glume, has two light longitudinal ridges and is hairless. Florets: borne on stalkless spikelets have sterile lower florets that are reduced to transparent lemmas, and bisexual upper florets with three anthers and an upper lemma that is membranous, cleft to the middle, and awned (2.5 - 17 mm long). Those borne on stalked spikelets have male florets with transparent lemmas that may or may not be awned (to 4 mm long) and sterile florets that usually lack lemmas. Habitat and ecology: This species is characteristic of Lake Michigan foredunes. It can also be found on sandy barrens and dry, rocky, limy glacial hills. Etymology: Schizachyrium comes from the Greek words schizo, meaning split, and achyron, meaning chaff. Scoparium means broom-like. This species occurs throughout the state in poor or impoverished soils and moist or dry, sandy soils, and is also rapidly becoming established in the better soils of the Tipton Till Plain. It is found on washed slopes and interdunal flats, in abandoned fields, and along roadsides and railroads. The extreme variability of this species has led authors to describe many forms. My Indiana specimens show a wide range of variability, yet I hesitate to refer any of my specimens to a variety. For example, about half of my specimens are glabrous, and the other half vary from those with a few hairs on the sheaths to those with a villous pubescence. Andropogon scoparius var. 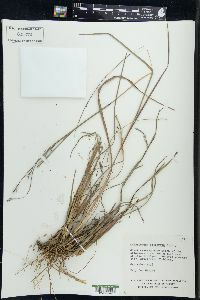 frequens, Andropogon scoparius var. littoralis, Andropogon scoparius var. 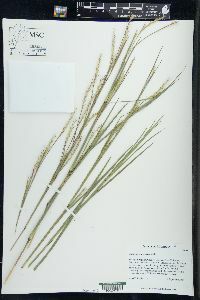 polycladus, and Andropogon scoparius var. villosissimus have been reported from Indiana but Buhl (Amer. Midland Nat. 16: 250. 1935) refers all of them to the typical form. Plants along Lake Michigan, growing on the bases of the low dunes in West Gary, present, in the field,' a striking difference because they are smaller and very glaucous. However, an examination of the floral parts shows them to be identical, or nearly so, with the typical form.